Promain Paint of Hitchin in Hertfordshire are the UK's leading industrial paint specialists. With their vast knowledge and experience in the paint and coatings field you know you are dealing with professionals. 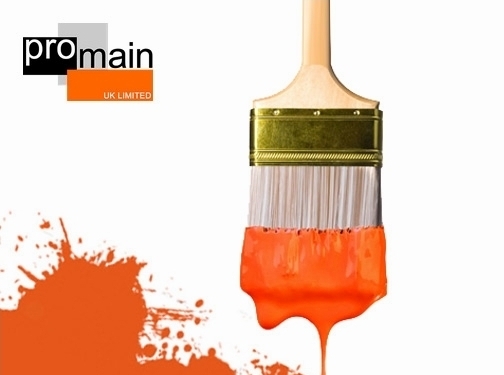 Promain offer to deliver their paint and coating products throughout the UK along with having a specialist technical team to help with any queries from their base in Hitchin, Hertfordshire. Whether you are looking to renovate your home or garden then Promain have every paint you may need from driveway paints, garden paints and swimming pool paints to name just a few. Promain also work with nationwide businesses and local councils to supply their industrial paint and coatings on a larger scale. One of the biggest markets that Promain work within is the industrial flooring industry, having worked with some of the biggest companies in the world they not only supply floor paint and coatings that have a top quality finish but also a quality finish that lasts, Promain only stock the very best of products. Promain are the UK's leading supplier of home and garden paints, ideal for almost every home and garden project you can think of. We supply paints, varnishes and oil solutions for almost any horizontal or vertical surface you can put your hands on around the home or garden. Contact us by calling 01462 421 333 and speak to one of our professional team regarding home or garden paint. As well as supplying a large number of industrial paint products, Promain UK Ltd also have a massive supply of Anti-Slip Paint, which we know is a must have for anyone working in a factory or industrial style environment with certain health and safety risks. One of the biggest brands we work with are 3M Scotchkote and we provide a massive supply of Scotchkote products for you to choose from, with a great selection of Anti-Slip Paints. Across the winter months, Promain know that driveways and patios can become worn out and tired due to constant abrasion and weathering. This can lead to cracks and damages occurring which need attending to before the damages become severe. Promain offer a huge selection of concrete repair kits, and driveway paint that can rejuvenate your external concrete services in a matter of hours. Contacting Promain could not be easier, take a look at their website for what they offer or why not pick the brains of their technical team on 01462 421 333? You want to talk paint? This is what they love and have a real passion for, why not call in to their base in Hitchin for a chat? UK (Hitchin, Hertfordshire) based business - established over 30 years ago - providing industrial paints and surface coatings. Website includes e-commerce facilities, delivery and returns information, terms and conditions, blog, full contact details including company registration and VAT numbers.